Q: Can you build double or triple story? A: I would be cautious in building three stories with earthbags. I know of some two story buildings that seem to be fine, but going much higher than that would require some very careful engineering. Actually, any earthbag house needs to be carefully designed to consider the special requirements of this form of building. Q: What brings me to contact you is curiosity if anybody that you are aware of has constructed, or has considered, a three-story silo-shaped (round) building. Perhaps 25' diameter with poured concrete floors/ceilings at 10' intervals, and a poured concrete rooftop as well. A: I am not aware of anyone having constructed such an earthbag structure, but it does seem feasible to me. Ordinarily I would caution someone building over two stories with earthbags, but a cylinder-shaped building might be an exception to this, since it is inherently such a stable shape. Poured concrete floors and ceilings can be very strong when properly reinforced, and these would provide excellent stabilizing diaphragms in your design. With this method, each story would basically be independent from the one under it in terms of calculating wall thickness/height ratios (see below). Thicker walls at the base would lend greater stability. A rule of thumb for earthen walls is that the ratio of thickness/height needs to be at least 1/10; so in your case with a height of 30', the base should be at least 3'. As long as these pillars don't interfere with the running bond of the earthbag walls (i.e., either inside or outside the wall), then they could lend additional support. I actually don't think they would be necessary. In a true cylinder shape there would be no straight sections. A: I can't give you a definite number for a safe height, because there are too many variables in design that affect this. It depends on the thickness of the wall, the placement of any buttresses or interior walls, whether the walls are curved or not, the way that lofts, second stories and roofs are attached, etc. So you really need to carefully assess all of these things, and you may need the assistance of a knowledgeable engineer. In general, with earthen architecture, you need to maintain ratio of 1:10 in wall thickness to height. Q: I was thinking of making a two story house with earthbags. Basically it would just be a cylinder extending straight up. Around the cylinder I would have posts extending up to roof height. On the first floor I would use these posts to make a balcony and extend the posts right across the roof to make the floor. I would use the top of the posts to repeat this to make a roof. My question is would a single thickness of bags in conjunction with the posts be strong enough to build more than one level? A: I would think that you could do this successfully, especially if you tied the earthbag wall to the posts at intervals to lock the structure into a monolithic whole. Q: Can one design a earthbag home with two stories? A: Yes, this is distinctly possible. My dome home actually had a large loft area, so it was essentially two stories. Obviously, the engineering needs to be carefully analyzed for such an undertaking. Placing diaphragms (or floors) across an earthbag structure greatly strengthens the form. Q: I need to build a barn essentially two stories, 1200 feet on each floor. I am thinking earth bagging is the way to go. Is this realistic and if so, how can I learn to do it? A: We generally try to discourage two-story buildings with earthbags. This doesn't mean that they can't be built, just that the engineering involved may be complicated. One possibility is to build the first floor with earthbags and then switch to lighter weight materials for the second. There is quite a bit of information available about the process of building at this website, including books and videos. Also there are a number of workshops listed where you could get some hands-on training. Could I at least build one story with 12 foot ceilings? If I can do that, then I can internally put in a framework for a 20 X 30 second story within the bag structure. What does that sound like? I think you can go up to 12' without problem, if you are careful to buttress the wall properly. The rule of thumb with earthen walls is that you can go up 10 times the width of the wall, so in the case of a 15" wall, you could theoretically go up about 12'. Q: If one wants to build a tower using the earthbag method, considering one would use wood to segmentally divide the stories, do you know to what height such a construction can be? A: I don't know of any earthbag structures going beyond two stories, and there are very few examples of this. In general with earth building it is advised to follow the ratio of 1:10 in width to height. In Yemen there are adobe buildings that are perhaps 6 stories high following this ratio, but that makes for very thick walls at the base (they can taper to more narrow walls as they go higher.) Definitely it helps stabilize such structures to have diaphragms of floors at each story. Also, I would suggest using some reinforcement techniques similar to what is shown here. Q: What kind of foundation would be needed to support a two-story structure? Would we have to assume that the standard rebar cement foundations found in modern building techniques would be necessary? A: I expect that a two-story structure could be designed without the need for a conventional concrete foundation. This is one of the beauties of earthbags: they can create their own foundation. Q: I'd like to incorporate a second story into the house, or at least a loft, and I'm trying to figure out the best way to go about it. Every earth bag place I've seen online is a single story, so there's not really much info on how to do a second story. The first thought I had was to keep stacking bags, but it doesn't seem like it would be structurally sound once you get above 10 or 12 feet. So my idea was to build the first floor to about 9 or 10 ft tall with the earth bags, then framing the top floor or loft with recycled lumber. Does that sound possible? A: You are right that most earthbag structures don't go over one story, although most domes are high enough to contain a loft. One reason for this is that generally with earth construction it is best to maintain a ratio of 1:10 wall thickness to wall height, so the higher you go the thicker the wall needs to be. Certainly switching to wood frame for the second story is a good solution, but it is possible to go all the way with earthbags. 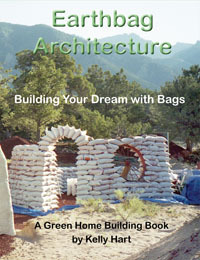 I helped design a model two-story earthbag home in Mexico. Towards the end of the article it shows how to proceed with the second story.